There have been some amazing results with the 6.5-284 over the last couple of years. In 1000-yard benchrest, the 30-calibers are still used by more shooters, but the little 6.5 is becoming more prevalent every season, and taking home more than its share of fake wood trophies. Rich DeSimone set a tough record to beat in the IBS Light Gun category with 1.564" 5-shot group at 1000 yards with his Ackleyized 6.5-284 Super and Clinch River 147s. Last year alone, John Hoover and his daughter Marissa each nailed perfect 100 scores at Williamsport with their 6.5-284s. 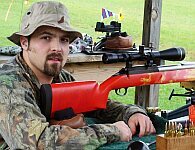 In 1998, John shot Williamsport's first-ever perfect Light Gun 100 score, with 5X and a 5.585" group for TEN shots. The 6.5-284 can easily be made competitive with the large selection of quality powders and bullets available. Lapua, Norma, and Hornady all produce 6.5-284 brass, with Lapua the favored selection among brass in current production. You can also use Winchester-brand .284 Win brass necked-down from 7mm to 6.5mm, but this may be in short supply soon (see sidebar below). H4350 and H4831SC seem to be the most popular choices in the long-range competitive arena, though there are several other appropriate choices available (Vihtavuori N160, N165, and N170, Reloader 22, Reloader 25, H1000, IMR 4350 and 4831). With many superb 6.5mm factory and custom bullets available, three competitive brands of brass, several great powders, many good primer choices, the combinations are nearly endless! 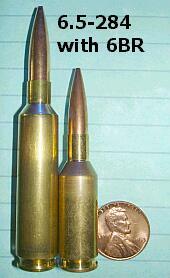 6.5-284 brass is produced by Hornady, Lapua, and Norma. Lapua and Norma cases have performed far better than the Hornady brass, and Lapua is the preferred choice of most shooters. It is cheaper than Norma from most vendors, and most shooters believe it is both more consistent and more durable than Norma--giving longer brass life and performing better with hot loads. Unfortunately, both Lapua and Norma have delivered a few disappointing lots of brass over the years. But for the most part, the brass from these two companies is excellent, and will deliver superb results, particularly if you sort cases by weight. A third option is using Winchester .284 brass, necked-down to 6.5mm. There are two varieties of Winchester brass, the bulk Win brass sold currently, and an earlier version that was sold in individual 20-round boxes. John Hoover uses the early Winchester brass and he believes it is superior to anything you can buy today. He's done extensive testing with Winchester, Lapua, and Norma brass, and his early production Winchester has always performed best in his family's rifles. Rumors that Winchester has stopped production of .284 Win brass are false. We contacted Olin (parent of Winchester), and here is the official story: "Winchester .284 brass is a 'seasonal production item'. This means it is not produced continuously, but rather is made in batches during the course of the year in response to dealer orders. Winchester did not receive sufficient orders for the 2005 production run of this caliber, so neither loaded rounds nor shellcases will be produced this year. The next possibility for a production run would be June of 2006." So, production has NOT been discontinued, but we may start seeing supply shortages by late 2005. As of July 15, 2005, there are many vendors who have Winchester .284 Win brass in stock, including LockStock.com ($37/100) and ImpactGuns.com ($17.12/50). Preparing for this article, we measured some current un-turned Lapua brass with a 142 SMK in place. The outside neck diameter at the mouth was 0.296". Most top shooters do turn their necks for consistency, but there is no prevailing standard for neck-wall thickness. Check with a dozen 6.5-284 benchrest shooters, and you'll find a wide variety of chamber neck diameters, from 0.286" to 0.298". There does not seem to be a magic number. Bill Shehane runs a .290"-neck chamber with an 0.288" loaded neck (.002" clearance). The Hoover family has won numerous matches shooting 0.296"-necked rifles with an 0.293" loaded round (.003" clearance). John Hoover told us "after shooting this cartridge for many years, I strongly believe you need .003" clearance on the loaded round, minimum, and .004" won't hurt you. I've seen a lot of people have problems with too little clearance." Mark King has smithed a lot of winning Williamsport rifles using a .294" neck with a 0.291" loaded round. Jason Baney feels this is the best set-up. "Mark likes .294, and so do I. It lets you clean up 99.9% of all the necks. Removing any more brass than that just isn't necessary, and I think a lot of guys find the thicker necks shoot really well." At the other end of the spectrum, gunsmith Rick Beginski has chambered a number of record-setting 6.5-284s using a .286" reamer. This works with a 0.2843" loaded neck diameter with about .010" neck-wall thickness. Using this chamber, Billy Copelin set multiple NBRSA world records in recent years, including both small group and score records. If you hate neck-turning, and want to just barely skim the necks, Dave Kiff has a 0.297" 'Norma Match Reamer' that has worked really well for many shooters. How about the no-turn option? For a tactical, varmint or hunting rifle, there is absolutely no reason not to go with a no-turn neck. You'd want at least a .299" neck for a no-turn hunting rifle, and 0.300" might be better. A host of barrel-makers can produce a great 6.5-284 barrel: Broughton, Hart, Lilja, Krieger, Schneider, Shilen, Spencer, Walther among others. Bill Shehane took the 2004 two-gun 1K Nationals shooting a 1:8 twist Broughton 5C, but he also competes with a 1:8.5 Krieger. John Brewer has achieved great results with Kriegers, and he's very impressed with his latest barrel, a polygon-rifled Schneider: "The 1:8.5 Schneider P5 is the barrel with which I won the National Championship and it is the most accurate barrel I've shot in 6.5-284--and I've had at least a dozen". It appears that the polygonal rifling somehow reduces throat wear. John tells us: "with some barrels I'm always chasing the lands. With the Schneider, I haven't had to move my bullets out very far at all." Barrel life is a key issue for 6.5-284 shooters, because barrels can loose their accuracy edge in as little as 800 rounds, though 1000 rounds is more typical. But don't throw away that barrel merely because the groups start opening up. Sometimes some aggressive throat polishing can restore much of the accuracy, and you can get hundreds more rounds of useful life by having the barrel set back.John Hoover reports: "I've had many barrels set back 1". Nearly always they shoot as well or better than before." There are many good high-BC 6.5mm bullets available today. Matches have been won and records set with bullets from Berger, Clinch River, Lapua, Sierra and more than a few boutique bullet-makers like Jimmy Knox and Bob Cauterucio. Among factory bullets the top three choices are probably the Sierra 142gr Match-King, Lapua 139gr Scenar, and Berger 140gr VLD. Comparing those three bullets, the Sierra has the sturdiest jacket, while the Berger has the highest claimed Ballistic Coefficient (BC). Field tests do show that the Berger drops less than a 142 SMK at 1000 yards, when launched with similar velocity. The majority of top competitors we've polled are using the 142 SMKs, but those who are shooting 139 Scenars are very happy with the Scenars' accuracy and dimensional uniformity. If the 142s don't work for you, definitely try the Scenars. And the Clinch River 147s still hold some important 1000-yard records, but availability can be an issue. In years past it was de rigueur to sort the 142 SMKs by bearing surface length to achieve optimal accuracy and consistency. With many recent lots of the 142s however, the bullets have been very consistent. Jason Baney reports: "Well, I got my new lot of 500 142 SMKs sorted by bearing surface, and I must say I am impressed. These are on par with custom bullets as far as consistency." Bill Shehane currently favors the 142 SMKs, sorted in .002" bearing surface increments, because he feels they produce the most consistent results at 1000, with fewer unexplained flyers. Bill observed: "I've also shot the Berger 140s and the Lapua 139s. Both brands are good bullets and I've shot some of my smallest groups with them. But I've found the Sierras to be the most consistent. In our 1000-yard game, consistency is key. One tiny group won't win a championship. A 'four and one' or a 'nine and one', with just one shot out, will ruin your whole day. For me, that happens less often with the Sierra 142s." Probably the two most popular powders in the USA for the 6.5-284 are Hodgdon H4350 and H4831 (produced in both long and "short-cut" versions). Bill Shehane, 2004 1000-yard Shooter of the Year, uses H4831sc (Short Cut). John Brewer, 2004 U.S. F-Class Champion, favors H4350. But many other medium-to-slow burn rate extruded powders work well. These include Alliant Reloader 22, H1000, IMR 4350, Ramshot Magnum, Vihtavuori N160 and N165. Note, while Hodgdon's load data is the same for both H4831 and H4831sc (short-cut), the powders have different load densities, so, in practice, you need to work up the load separately. The long-cut version fills the case more, which normally results in higher pressure for the same weight in grains. Most people seem to be using CCI or Federal match primers. However, many people have had good results with Remington 9.5s, Winchesters, RWS and the Russian (PMC) Primers. One thing that is certain is that the CCIs have harder cups and can withstand higher pressures without piercing than Federals. We have confirmed this with Blount, the parent company of both Federal and CCI. Bill Shehane, who uses H4831sc tells us, "I've tried them all--CCIs, Winchester, Russians--and nothing beats the Federal 210s for consistency and good numbers over the chron." On the other hand, John Hoover, who uses H4350, has tested both Fed 210M and CCI BR2 extensively and his most recent results have shown lower ES and SD with the CCIs than with the Federals. John has also recently started experimenting with RWS Primers and the results are promising: "So far the RWS primers seem really good". He's planning some serious testing of RWS and Russian (PMC) primers this fall. Rust tells us: "For absolute minimum ES and SDs nothing has come close to H4350 with CCI primers. I get single digits with the plain old CCI large rifle primers[.] Fed 210s do not do as well with H4350 although I can't say if that's due to flame temps or brisance or compound make-up or what... Another match load I've had good luck with is RL-22 backed by a Winchester primer. The Winchester primer seems to work best with RL-22." One advantage of the CCI primers is that you can purchase them pre-loaded in plastic 25-primer strips for use with the RCBS APS hand-priming tool or RCBS bench-mount tool. 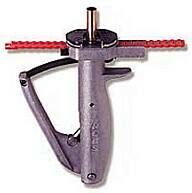 The APS hand unit is the Editor's favorite priming system for match rifle rounds. The RCBS unit has good "feel" (for seating feedback) and plenty of leverage to fully seat any brand of primer, even the Russians, which need to be seated very firmly into the pockets. Using the RCBS unit, with its universal shell-holder, is fast and very convenient. There is also a similar bench-mounted unit. With either hand or bench tool, the color-coded strips make it easy to store primers or to switch between different brands while testing (you can load Fed 210s or other primer brands into APS strips using an RCBS strip-loading tool). Bottom line: No one brand of primer is always "the best". You'll probably need to do your own testing to determine the ideal primer for your barrel and load. While most lots of Lapua and Norma brass have been very good out of the box, thorough case prep will enhance accuracy and consistency. This certainly goes for Winchester brass as well. You'll want to first inspect for any obvious defects and cull those cases. Next full-length size the brass, so the cases are as dimensionally uniform as possible before trimming. Then sort your brass by weight, after trimming to a consistent length (some shooters prefer to trim after initial fire-forming). Next, most top shooters deburr and ream the flash hole for consistency and uniform the primer pockets to a consistent depth. (Some people feel flash-hole reaming is not necessary with Lapua brass because of the way Lapua forms its flash-holes. Moreover you can certainly make things worse unless you ream with the proper tool, such as a K&M flash-hole reamer/deburrer. Still, most of the top shooters we polled did some clean-up on their flash-holes, even with Lapua brass.) After those steps, be sure to chamfer the necks and brush out the neck interiors to remove any burrs or stray brass shavings. Loading for this cartridge can be relatively simple--or as complicated as you can make it. There is a wealth of knowledge about the round and some great loads have been worked out. Using Hodgdon H4350 or H4831sc with bearing-surface-sorted Sierra 142s will get you in the running. For the 139gr Scenars, our friend Fatboy sums it up this way: "For Lapua brass, [try] 47-49gr H4350 (Fed 210m), or 49-53gr H4831 (Rem 9.5), or 47-50gr N160 (Fed 210m). If one of these loads doesn't work for you, you are doing something wrong, or you need to switch to 142 SMKs. Each of these loads are proven winners by AMU shooters as well as Regional Prone and F-Class winners. Start low and work up, don't concern yourself with a specific MV. Go with accuracy, and clean often." When long-range competitors first started shooting the 6.5-284, many pushed the cartridge to max velocities. However, it soon became clear that peak velocities did not produce the best match results. The general trend has been to back off loads to the 2950-3000 fps range with 142 SMKs. This seems to produce better accuracy in most guns, along with reduced throat wear. In selecting a velocity, most of our "experts" say to pick a load that delivers best accuracy with low ES and SD. What velocity that represents will depend on your gun and barrel. John Brewer runs his loads about 2950 fps, while Bill Shehane normally loads to about 3050 fps in an Ackleyized 6.5-284 case. When loading for the 6.5 the options are endless, so I find it best to select ONE primer/bullet/case/powder combo and run with it until it you can prove it doesn't work. Pick ONE bullet that you like, one that is easy to obtain, and stick with it unless it proves incompatible with your setup. Also stick with one appropriate, readily available powder and primer tandem in the beginning as well. Most of the time you will be able to find a competitive load with a well-known set of the components shown here. If you are struggling with velocity spreads, change out primers. If the groups aren't quite tight enough, change the seating depth a bit. When starting with my 6.5-284 I made a mistake and immediately tested four different bullets at once. This generated information overload, so I decided to stick with the 142 SMK and H4831sc, because they were known to be competitive and readily available. The 139gr Lapua Scenar is another great choice to start with. You should basically start with a single known set of components and conditions and work from there. In my case these are: Lapua brass, 142gr SMK, H4831sc powder, Fed 210m primer. I start 0.020" into the lands, with light 0.001" or less neck tension (just enough that you can't pull the bullet out with your fingers). I prefer to go into the lands, even when fire-forming, because you get a good crush fit that stabilizes the case. Then three-shot groups with 51.3, 51.6 and 51.9 grains showed a nice small cluster at 51.6 grains. Velocities were close as well. This H4831sc/210m/SMK 142 combination has worked well since the beginning for me, posting the third smallest group (out of over 1200 groups) in the Williamsport Light Gun category: 5.352". (The second smallest group was also a 6.5-284 at 5.210", but the smallest was taken with a 7WSM at 4.79"!) It also did great at its only trip to 500M, a GroundHog Match where I took home the $400 First Prize, with a 1.350" small group. There are many other winning combinations out there though. In particular I know many people have great success with H4350, and many shooters do very well with considerably more neck tension than I prefer. 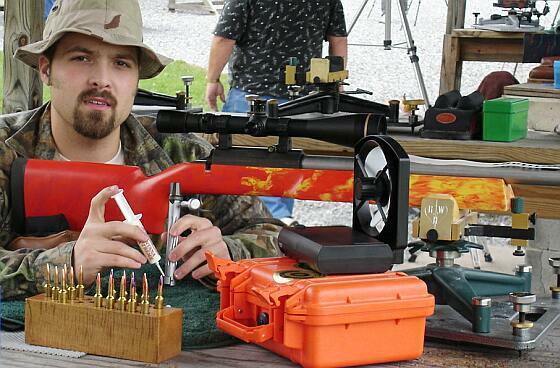 Editor's Note: Mr. "Keep it Simple" at the Bench with his 6.5-284 Viper. Hey Jason, what's all that clutter? Relatively short barrel life is the one big problem with the 6.5-284. This cartridge wears out throats quickly, and carbon build-up is something you have to deal with. Keep in mind that you don't necessarily have to toss that barrel the day it stops shooting tiny groups. John Hoover regularly has his barrels set back 1" after a season and he says the accuracy is often BETTER than before. Going from 30" back to 29" he has not observed any meaningful loss in accuracy. And has no problem reaching the velocity he wants with the 1" shorter tube. John reports that, after set-back, his barrels continued to shoot accurately for hundreds of rounds: "From what I've seen, setting a barrel back can effectively extend the barrel's useful life from one season to two, or pretty near, depending on how much shooting you do between matches." We asked Bill Shehane about setting back barrels. He told us: "I have done it both ways and really had better luck with a new barrel. But one or two occasions when I had a very good barrel I had the chamber end cut off and 1" off the muzzle and the barrel continued for another 500 rounds before dying. Boots Obeyermyer taught me a trick about this many years ago and it worked on these two different rifles. Instead of just making the crown crisp again, Boots told me to cut it off 1" because most barrels will fish-mouth in that last 1" and just making the crown fresh does not do a 100% job. I have done that to all the barrels we have set back and plan to do it to my present HG barrel in 30 caliber now." Shehane added that, if you plan to set back your barrel, don't wait too long: "One word of advice is that if you expect a 6.5-284 to go 1500-1800 rounds don't wait till it goes 1200-1300 to set it back. If it shoots very good set it back at 900-1000 rounds. I know its hard to mess with one that is shooting like that but I have found if you are going to do it--do it now and it will go 700-800 more. But if you wait you have wasted your chambering money! I had one 8.5" twist Krieger that went over 2700 rounds doing this but that is the rare exception. I still like new fresh barrels that will shoot the group FAST. Some barrels I have had will shoot a group at 200 yards using "Point Blank" wind flags at 50 and 100 yards to test with but if I then turn around and try to shoot the same load say five shots in 15-20 seconds or less they just don't want to stay together. Once I zero in on a condition I like to get my bullets on the paper as fast as I can before the let up or the push comes back. All that is out the window if the barrel will not shoot fast and some just won't. Of coarse if the condition is mild and you can plot and take your time most all of the good barrels will shoot but the real good barrels for me shoot when you ABUSE EM and shoot very fast or take your time. A shooter only gets a barrel or two in his lifetime that will do that and he needs to be aware of it and take good care of that barrel. Or you can learn the hard way like I did and let everyone in the country shoot your only 'Hummer Barrel' out in two seasons. I did it about 10 years ago and have not another barrel yet today that would shoot like that one. But I am still looking." How long can you expect a 6.5-barrel to last? Fatboy says: "Depends on the barrel steel, your firing style, your cleaning methods and your allowable accuracy. I have had them go as early as 700 rounds, and one going strong at 1200 when I pulled them. Most go about 1000 to 1200 rounds. My last one is at 1040 and still shooting cleans at 500 yards and high 180's at 1000." Fatboy adds: "Barrel life may depend on luck of the draw. I will say, copper build-up and glazed carbon in the throat is the death knell for these. I am no fan of JB [cleaning paste], but it may sometimes be neccessary. I'm ashamed to say it, but I use it about every 250 to 300 rounds if the rifle stops shooting the way I like it. If it shoots, the JB stays in the cleaning kit. That will generally bring back the accuracy, but makes the copper harder to clean after the scrub." John Brewer has seen barrels go as early as 700 rounds, though generally he gets about 1000 rounds or more of good barrel life. How does one know when a barrel is "shot out?" John explains that the rate at which it fouls out will tip you off. "I won't travel across the country to a big match with a barrel with 700 rounds--it's too close to its end life to chance it. You see barrel end life when the group opens with nothing but fouling shots. The barrel is not worn out per se, but it fouls out MUCH more quickly. It may still shoot a tiny 10-round group but it won't do thirty. In the matches ten accurate rounds won't cut it.The barrel may hold accuracy for 10 shots but not 30." John has restored accuracy to a couple barrels with very rough throats by using Cratex points (a rubberized abrasive Dremel Tool attachment shaped like a bullet). He turns the point down in diameter to fit the bore, then pushes it through with a cleaning rod. This is sort of like fire-lapping without the fire. NOTE: This is really a last resort procedure, and is done with hand pressure only--never with power. Try it only if nothing else works. How do you maintain accuracy with a 6.5-284? Fatboy tells us: "Keep the throat clean! I'm having my fifth 6.5x284 barrel put on now, and if you take any advice from this [article], or me for that matter, it is to keep the throat clean." 600-yard IBS Shooter of the Year Joel Kendrick believes that, with fine match barrels, carbon fouling is the real culprit: "Most people worry about copper when they should be worrying about carbon. I've been using a new product from Tom Meredith, a liquid he simply calls "TM". I used this all week at the Super Shoot and it works great on carbon." How do you find the carbon ring? Here's what John Brewer does. He pulls a NYLON bore brush back through the bore, from muzzle towards the breech. It moves smoothly until it hits the carbon build-up where you'll feel lots of resistance on the rod. That's where you need to scrub with Iosso paste or JB. NOTE: we do NOT advise reversing a phosphor bronze brush through the bore. And NEVER short-stroke with a tight-fitting bronze brush! Hodgdon H4350 49.0 CCI BR2 Sierra 142 2975+ fps Hoover Match Load. Fire-form at 48.0. Hodgdon H4831SC 51.0 F210m Sierra 142 2885 fps Froggy's Tactical Load, 26" bbl. Hodgdon H1000 55.0 RWS Sierra 142 2880 fps Hodgdon Max load (compressed). Moly SMKs. Win brand brass, necked-down. Hodgdon H4350 49.5 CCI BR2 JLK 140 2980 fps 28.5" Krieger. Very consistent. Vihtavuori N160 48.5 F210m Lapua 139 2950 fps Moderate, prone competition load. Vihtavuori N165 53.0 Win LR Lapua 139 2940 fps Jumped .025" in 30" Krieger bbl. Vihtavuori N165 53.0 F210m GTB 141 2950 fps 33" bbl. Burns clean, good barrel life. Cauterucio VLD. WARNING: ALWAYS start 10% below these loads and work up. 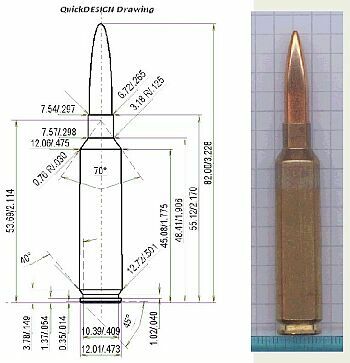 Seating depths have a huge effect on case pressures--moving the bullet just .010" one way or another can push a "safe" load into the danger zone. Lot variances with powders can be extreme. Whenever you buy new powder, even the same brand, start 10% low. NEVER assume pressures will be safe if you change lots or ANY component. Case web growth is probably the most reliable indicator of over-charge. By the time you're getting stiff bolt lift or ejector marks with fresh brass you've exceeded proper pressure levels. Ambient temperatures can alter pressures considerably. Don't assume cold weather loads are safe in summer. As you approach max loads, reduce the load increments. Just 0.2 grains can make a difference.